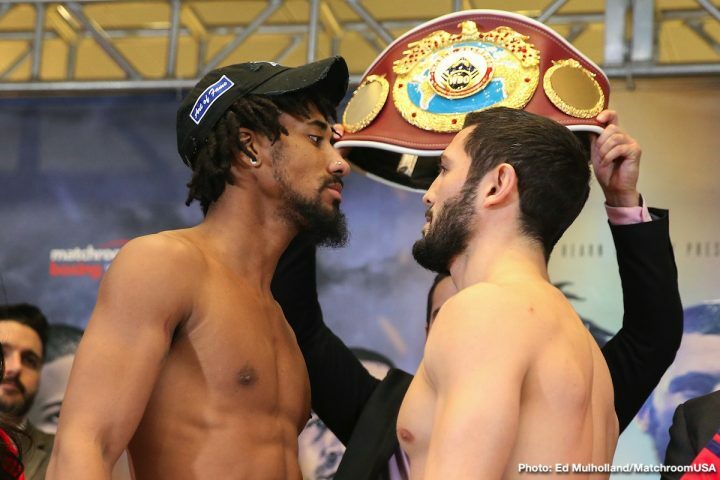 By Jim Dower: WBO middleweight champion Demetrius Andrade (26-0, 16 KOs) returns to the ring to defend his title against Artur Akavov (19-2, 8 KOs) this Friday night on DAZN at Madison Square Garden in New York. Former three division world champion Jorge Linares (45-4, 28 KOs) will be on the undercard facing Pablo Cesar Cano (31-7-1, 21 KOs) at light welterweight. 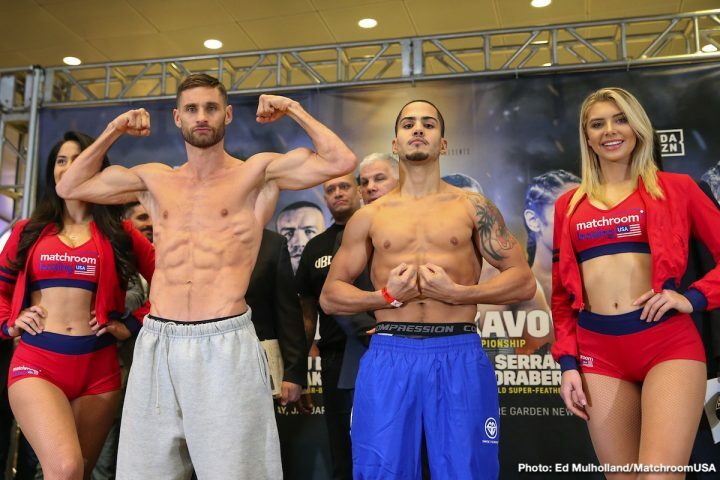 Last and not least, former WBO light welterweight champion Chris Algieri (23-3, 8 KOs) will be fighting Danny Gonzalez (17-1, 7 KOs) in a 10 round fight on the card. This is a Matchroom Boxing USA card promoted by Eddie Hearn. Unfortunately, Hearn hasn’t done a great job of promoting the card, because few fans even know that Andrade, Linares and Algieri are fighting this Friday night. It’s interesting that Hearn has talked so much about taking over boxing in the U.S, and yet he’s putting on a card this Friday that he’s done very little to promote. If this is how Hearn plans on dominating the American market, he’s doomed to failure. It’s not just enough to put the cards together on DAZN. Hearn needs to also promote them, which he clearly hasn’t done with the Andrade vs. Akavov card. 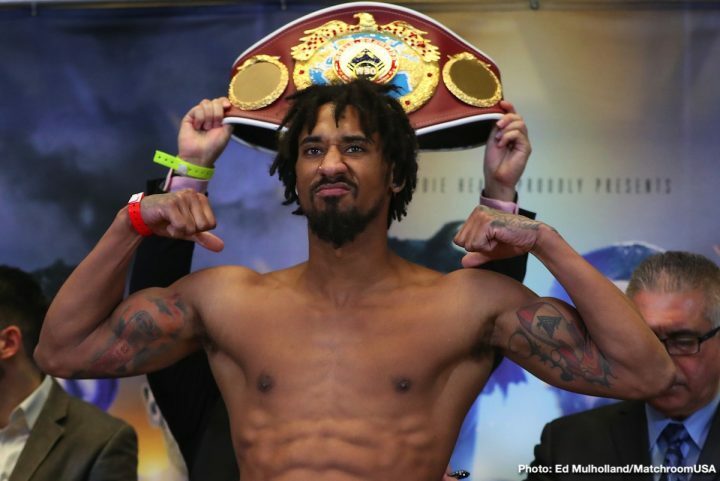 Andrade, 30, recently won the vacant World Boxing Organization middleweight title on October 20 in beating Walter Kautondokwa by a 12 round unanimous decision on DAZN. 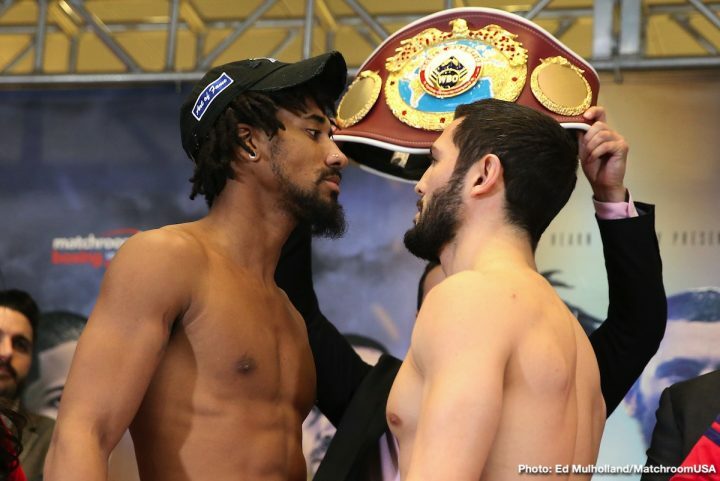 Andrade was supposed to face WBO champion Billy Joe Saunders, but he tested positive for a banned substance, and he ended up vacating his WBO belt after he failed to receive a boxing license to fight by the Massachusetts state Athletic Commission. Hearn is keeping Andrade active, but not against great opposition. 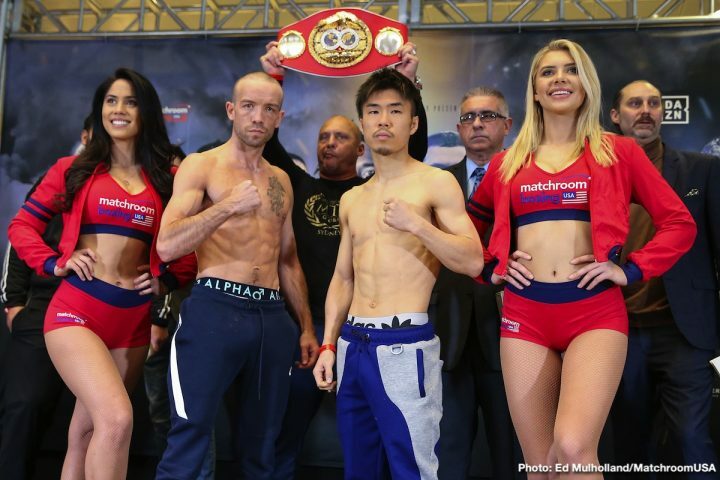 Andrade’s opponent for Friday, 33-year-old Akavov, has faced one notable opponent during his eight-year pro career in Billy Saunders, and he lost to him by a 12 round unanimous decision in 2016. The rest of the guys that Akavov has faced have been no name fighters. The way it should be done in the U.S is for Hearn to put together some good cards involving competitive fights, but this isn’t one of them. Andrade vs. Akavov is a mismatch, and so is the Jorge Linares vs. Pablo Cano and Chris Algieri vs. Gonzalez. These are all mismatches, and it makes you wonder if Hearn is hoping that as few U.S boxing fans hear about this card the better it is for him. What’s clear is Hearn is going to need to do a lot better than this if he wants to take over the U.S market. Andrade-Akavov and Andrade-Kautondokwa isn’t going to cut it. Andrade wants to fight former WBO middleweight champion Billy Joe Saunders, but it’s unknown when that fight is going to take place. Hearn is clearly chomping at the bit wanting to make the fight between Andrade and Saunders, even though it’s not a match that would translate over to the U.S market The casual boxing fans in the States have no idea who Saunders is, and even if they did, they wouldn’t his defensive style of fighting. Saunders is the complete opposite of former middleweight champion Gennady Golovkin in terms of his fighting style. Saunders is not exciting to watch. Chris Algieri, 34, is just making his second fight since losing to Errol Spence Jr. by a fifth round knockout in 2016. Algieri didn’t fight at all in 2017. When he did come back in 2018, he defeated journeyman Alan Hernandez (14-12-2) by a 10 round unanimous decision last November. It was a good performance from Algieri, but he wasn’t fighting a good opponent. Algieri should be able to beat Gonzalez, 29, without any problems. Gonzalez is not at the same level as Algieri has been at in the past. In 2017, Gonzalez was knocked out in three rounds by Danny O’Connor (30-3, 11 KOs). That’s someone that Algieri could likely beat without any problems if he ever mixed it up with O’Connor. If you like action, you’re not going to get your fill from watching Saunders. To enjoy Saunders, you’ve go like defensive fighting, movement, holding, showboating, and pot shots. The fight Hearn should be trying to make is Andrade vs. Canelo or GGG. Those guys would make it interesting for the boxing fans in the U.S. However, Hearn isn’t helping that become a reality with his weak match-making for Andrade. He’s not going to increase Andrade’s popularity by matching him against Kautondokwa and Akavov. Further, Hearn isn’t helping Andrade’s popularity by failing to promote his fights. Linares, 33, will be making only his second fight at light welterweight since moving up in weight last September in beating Abner Cotto by a third round knockout. 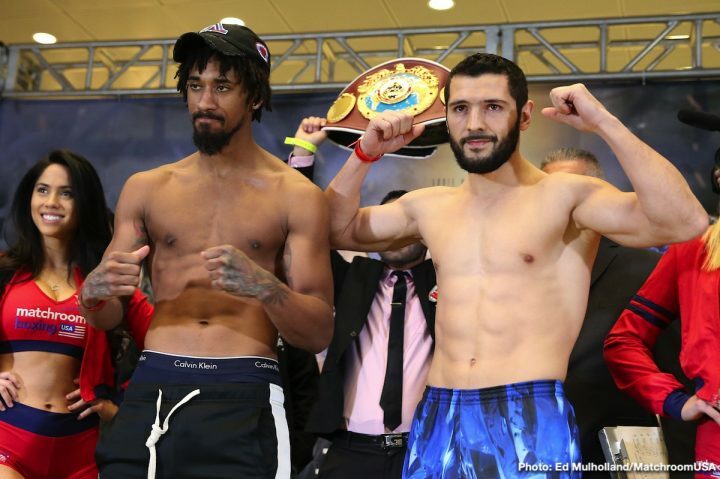 Linares, 5’8″, could find it tough to go anywhere in the 140 lb weight class due to his lack of size. Although Linares is a fairly tall guy at 140, he’s not cut out for the division. We’ll see that once Linares has to start competing with the talented fighters in the weight class like Regis Prograis. There’s a good chance that Linares will move back down in weight once he’s beaten by one of the better fighters in the light welterweight division. Linares was topped in the 10th round last May by Vasyl Lomachenko. Instead of staying at 135 to get a rematch with Lomachenko or at least go after a nice money fight against Mikey Garcia for his WBC belt. Linares would have a better chance of getting a fight against Mikey than the Top Rank promoted Lomachenko. Despite being still young at jut 29, Pablo Cesar Cano has been around the ring for a while since 2006. Cano is one of those fighters that started his pro career early at age 16. His career started out well, but things haven’t worked out for him in the last seven years in suffering losses to Paulie Malignaggi, Erik Morales, Shane Mosley, Fernando Angulo, Alan Sanchez, Fidel Maldonado Jr. and Marcelino Nicolas Lopez. Cano can punch a little, and he’s got the size to give Linares problems if he can impose that. Linares has the better boxing skills, and combination punching ability. For Cano to be able to wear down the smaller Linares, he’s going to need to be able to take his best shots early on in the fight to get him into the deeper rounds to try and beat him on size and power. it won’t be easy, but it’s possible. Cano is catching Linares at a good time with him having been stopped by Lomachenko. Cano is a good body puncher, and he could take Linares out if he’s able to land something hard downstairs that he’s not able to take.